News, Events, Weather, Magazines, etc. ABC News - Latest headlines mixed with featured reports, audio, video and market indexes. BBC News Online - UK and world news from the British Broadcasting Corporation. CBS News - Up to date news with the ability to get more in-depth information when it is required. CNBC - CNBC offers the latest news in the United States and Internationally. You can catch special reports, watch video interviews, and find the latest news in markets, investing, and tech. CNN - A good all round, constantly updated news site with a good depth of information for more than just the current news. FlipBoard - Flipboard aggregates content from social media, news feeds, photo sharing sites and other websites, presents it in magazine format, and allows users to "flip" through the articles, images and videos being shared. Readers can also save stories into Flipboard magazines. Forbes - This website has the appearance of a corporate blog. It contains articles that are written under the categories of Business, Investing, Technology, Entrepreneurs, Op/Ed, Leadership, and Lifestyle. Forbes gives people updates on news from many different categories. You can get the latest update on technology coming out and it's competitors. You can see what's new to invest in and what the smart stock is to save for retirement. Forbes offers easy to read blog posts to keep users updated and aware of the news in the world today. FOX News - Latest news backed by the resources of FOX. The website offers Fox business, Fox News Radio, Fox News Latino, etc. for many different varieties of resources on this site. Huffington Post - Breaking news and blogs are available on this site. You can see news from politics, entertainment, style, books, etc. on this site. There are also many external links to blogs from the site to get peoples' opinions on pretty much any topic. The Internet Archive Magazine Rack - The Internet Archive is a San Francisco–based nonprofit digital library with the stated mission of "universal access to all knowledge." There you will find archives of NASA images, books, movies, and so much more! They recently started archiving magazines as well. 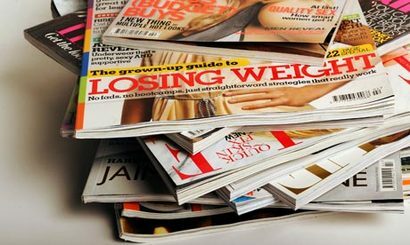 The Magazine Rack is a collection of digitized magazines and monthly publications. This searchable collection has over 135,000 digitized magazines that date back in some cases, clear back to the 1800's. MSNBC - Popular news site. Check out the online-only documentaries they have that are MSNBC originals. They have many online features such as video interviews, interactive maps, highlight photos, etc. Newsela - Newsela is a paid newspaper subscription that has kid-friendly news articles you could read to your children or you could use in a classroom. You do have to pay, but you can get a free subscription with a school or student email address. There are text sets you can use in your classrooms and also at your home to use with children to introduce them to news. 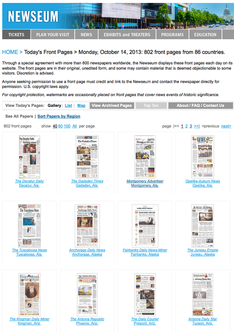 Newseum - Here you can view the daily front pages of over 800 newspapers worldwide. You can sort through the collection by region - USA, International, Asia, Caribbean, Europe, Middle East, North America, Oceania, South America, and Africa. Through a special agreement with more than 800 newspapers worldwide, the Newseum displays these front pages each day on its website. The front pages are in their original, unedited form, and some may contain material that is deemed objectionable to some visitors. Discretion is advised. Anyone seeking permission to use a front page must credit and link to the Newseum and contact the newspaper directly for permission. U.S. copyright laws apply. For copyright protection, watermarks are occasionally placed on front pages that cover news events of historic significance. NPR - A thriving media organization at the forefront of digital innovation, NPR creates and distributes award-winning news, information, and music programming to a network of 975 independent stations. Through them, NPR programming reaches 26 million listeners every week. Reuters - Excellent news site from the resourceful major news company with around 2500 staff. USA Today - Catch breaking news in the nation, world, and in Washington D.C.. USA Today offers the latest in politics, tech, sports, and many other areas. World News - Focus on international news from resources around the world. Yahoo! News - Good news portal from portal experts at Yahoo! News. Find out more from their odd news to their Yahoo! Originals. On Yahoo! News you also get the chance to watch Katie Couric's interviews, special live reports, etc..
AccuWeather - AccuWeather offers weather forecasts for wherever you live. Available online, for iPhone, iPad, Blackberry, Android, Windows Phone and Windows 8. Forecast - Full-featured, global weather service, complete with 7-day forecasts that cover world, beautiful weather visualizations, and a time machine for exploring the weather in the past and far future. With Forecast's fun time machine button, you can see what the weather was like or will be like on any day past or future. This tool could come in handy when planning an outdoor party! WeatherBug - free weather app that tracks current weather anywhere in the world, Doppler radar, hurricanes, traffic conditions, and more. Weather+ - Weather+ is setting a new standard for Weather applications! Weather+ gives you current weather conditions and a 5-day forecast of all worldwide weather stations. The information is visualized with beautiful full screen video loops for all conditions. This combined with a Flip Clock and a World Clock upgrades your iPad to a weather station like you never imagined. The Weather Channel - Consistently rated in the Top Five for News, Entertainment, and Information web sites by Media Metrix (formerly PC Meter), our Internet web site at www.weather.com features current conditions and forecasts for over 98,000 locations worldwide, along with local and regional radars. Many maps and other features available on the domestic cable television are also at one's fingertips, along with weather-related news, educational material, a weather glossary, a storm encyclopedia, and seasonal features. ﻿﻿Weather Underground﻿﻿ - Weather Underground is committed to delivering the most reliable weather information possible. Our state-of-the-art technology monitors conditions and forecasts for locations across the world, so you'll always find the weather information that you need. We also provide a number of specialist weather products such as severe weather alerts, hurricane tracking products, ski and sports weather, a trip planning weather tool, user uploaded photos and insightful blogs from out team of expert meteorologists.